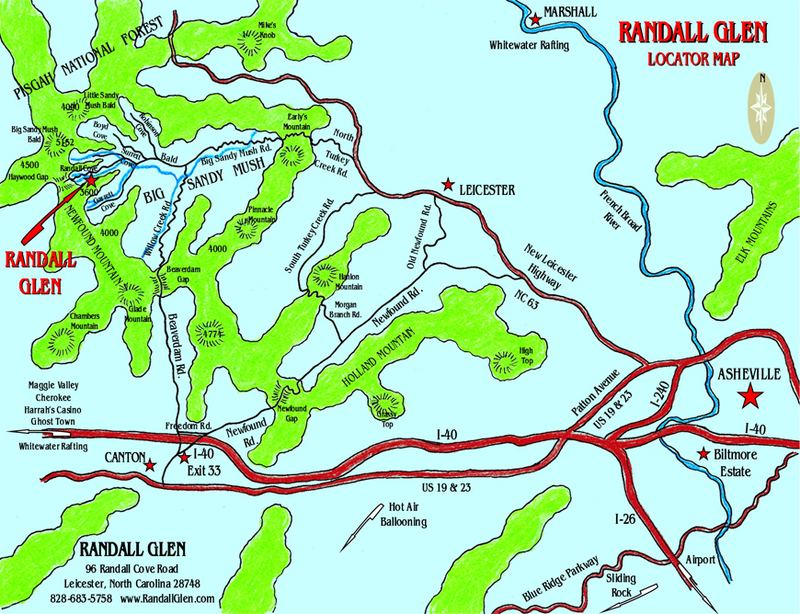 Randall Glen is located in the community of Big Sandy Mush, about 15 miles northwest of Asheville, North Carolina. We’re in the same county as Asheville; our post office is the town of Leicester. We’re surrounded by the highest mountains close to Asheville, and our glen is part of the Pisgah National Forest. We’re 30 to 45 minutes from downtown Asheville, the Biltmore Estate, the Farmer’s Market, the Arboretum, the Nature Center, Maggie Valley, and the Blue Ridge Parkway. We’re an hour or less from Cherokee, whitewater rafting, snow skiing, hot air ballooning, the Great Smoky Mountain Railway, and most other area destinations. Randall Glen isn’t hard to find, but you do go “over the river and through the wood” to reach us. In fact, a Southern Highlander once told us, “You’re so far back, you’ve got hootie owls for roosters!”. Once you’ve been here we think you’ll agree our secluded location is our greatest asset. We have the best of all worlds-we’re only minutes from Asheville and enjoy the benefits of superb City and County services, but we are at the very end of our valley. There are no highways, no housing developments, no “commercial strip”. There is absolutely no casual traffic passing Randall Glen. The only sounds in the night are those of nature. Sometimes the only indication that we’re in the modern world is an airplane high overhead. We are truly in the heart of the Great Smoky Mountains. This route is quite beautiful, with an unparalleled view at the top but it is challenging, with steep, winding roads up and over Beaverdam Gap. Coming down from the gap, 2.2 miles are unpaved. This route is best for confident drivers who are accustomed to mountain driving. Do not go this way in winter. The road can be impassable due to snow and ice. Be sure you have gas before you come! There are no service stations in Big Sandy Mush. NOTE: If you have an RV or camper DO NOT TAKE THIS ROUTE. It is very steep and winding and cannot be safely driven with a big rig. Do not take this route with any vehicle in winter. NOTE: From I-40 your GPS may direct you onto Beaverdam Road and over Beaverdam Gap. If you have an RV or camper DO NOT TAKE THIS ROUTE. It is very steep and winding and cannot be safely driven with a big rig.